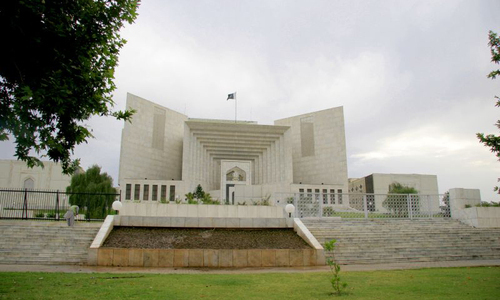 The Supreme Court (SC) on Thursday announced that the hearing of a case concerning senators-elect believed to possess dual nationality will be held on March 10 in order to ensure that only eligible legislators will be able to vote in the upcoming election for the Senate chairman. The election for Senate chairman will be held on March 12. Earlier this week, Chief Justice of Pakistan (CJP) Mian Saqib Nisar, during the hearing of a suo motu case concerning civil servants holding dual nationality, had ordered the Election Commission of Pakistan to withhold the notifications of four senators-elect who allegedly possess dual nationality. Justice Nisar had remarked that if the people who were entrusted to pass the laws of the country were dual nationals, they could “pass on classified information and escape to another country”. During the hearing today, the chief justice said that he did not know that the elections for Senate chairman were to be held on March 12 when he ordered the withholding of notifications and he did not want to withhold the notifications of “eligible voters”. Thereafter, he fixed the hearing of the case for March 10 in the SC’s Lahore Registry, so that senators-elect who are not dual nationals could be acquitted.